The mid-17th century was one of the most explosive periods in history across the British Isles. In England, a desperate king fought bitterly against his defiant Parliament; in Scotland religious turmoil sparked invasions from the north; and in Ireland, an oppressive regime led to an all-out Catholic rebellion. 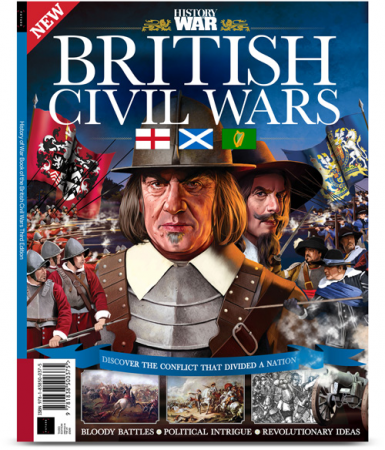 In this bookazine, we explore the how all these events, and more, combined to make up the British Civil Wars, from the political machinations of Parliament to the bloody battlefield clashes at Edgehill, Naseby and Marston Moor. We follow the meteoric rise of Oliver Cromwell and his New Model Army, as well as the tragic decline of Charles I – a king executed by his own subjects. We also investigate how the countries transformed in the period of Interregnum, for better and for worse, before taking a look at how the monarchy made a stunningly peaceful return during the Restoration. Whether you’re an enthusiastic novice or a seasoned history buff, there are a wealth of expert features, illustrated battle maps and superb imagery for you within these pages.